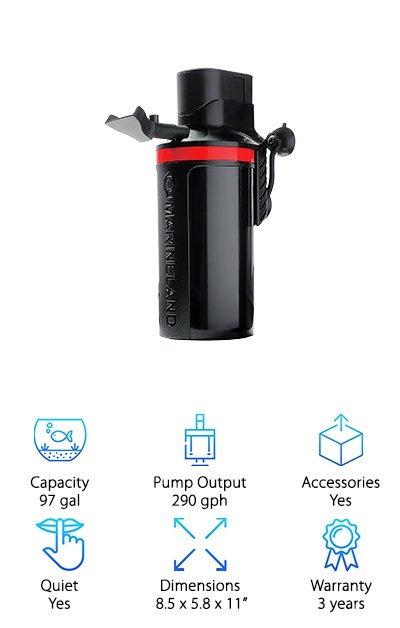 You've already had the canister filter vs power filter debate and have decided that a canister is the one for you. So, now you’re probably thinking, okay, now what? Well, never fear! We’ve researched a variety of best-selling and brand new products to put together our canister filter reviews. Before we get to that, let’s take a closer look at some of the most important features you need to keep in mind when shopping for your fish tank filter setup. Capacity - This is the measure of how much tank a filter can handle. For our purposes, the number we give you is the maximum number of recommended gallons a canister filter can handle. Don’t worry! There’s a wide range here. 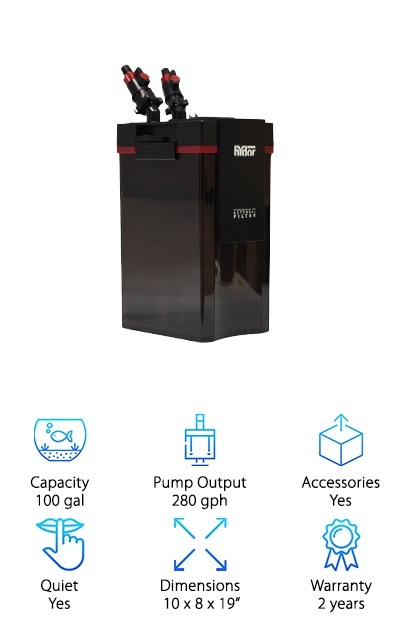 Pump Output - Pump output is measured in gallons per hour and tells how fast the water cycles through the pump. Ideally, it should be 4 times the volume of the tank. That means that the water will cycle through 4 times every hour. Accessories - We consider a canister filter to have accessories if it has any extras included. Most of the time, this means that filtering media is included. Sometimes, it’s just the right amount you’ll need to get started. Quiet - None of our best aquarium canisters filters are loud. That’s not a desirable quality in an aquarium filter. Some are louder than others but, for the most part, they’re pretty quiet. Or else they might not have made the list. Dimensions - This is important if you’re planning to put your canister filter in a cabinet or try to hide it in some way. You should have some idea of where you’re going to set it up and how much room you have. Warranty - Obviously, the longer the warranty, the better. These filters all have moving parts that can break over time. Make sure you know what is covered and, in most cases, what isn’t covered. You don’t want any surprises! Finding the right canister filter is no easy task, but you should always remember that your fish depend on you to give them a clean, healthy environment. In some cases, you turtles do, too. Don’t let your pets down. Now that you know what to look for, let’s take a look at our canister filter reviews. Short on time? Make sure you check out our top and budget picks first. Now, let’s dive right into our reviews! 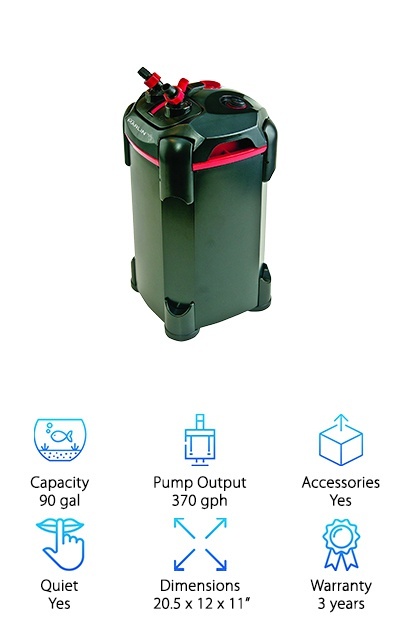 This is the best aquarium canister filter that’s powerful enough to handle an aquarium up to 100 gallons. This baby is packed with so many features, we don’t even know where to begin. Of course, it allows for multistage filtration which is essential for a healthy tank. It has a sound dampening design to make sure it’s nice and quiet. Clogs are rare thanks to the clog-proof intake strainer and dual layer foam screen. 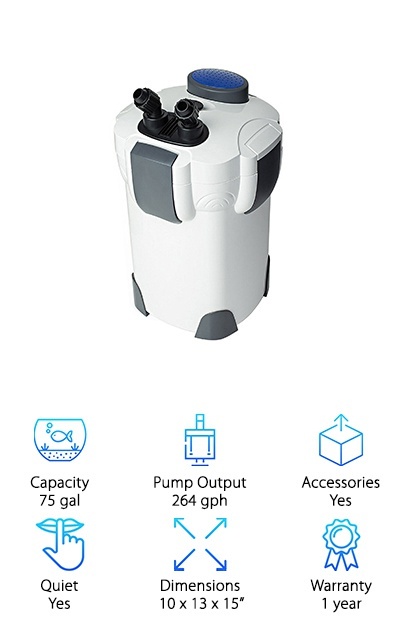 It comes with three filtration baskets and, here’s the kicker, they’re already packed with biological, chemical, and mechanical filtration media. One of the things that makes this filter so effective is that they hold a lot of volume. That means that the water has maximum contact with the media. And that means a clear tank. If you’re looking for a budget friendly fish tank filter setup, here it is! Despite being really budget friendly, it’s a good pick for aquariums up to 100 gallons. And listen to this. Something really cool about this one that sets it apart is the built in 9 watt UV sterilizer. Turn it on to help control algae and eliminate bad bacteria and viruses. Of course, this canister filter allows for all 3 essential stages of filtration, too. 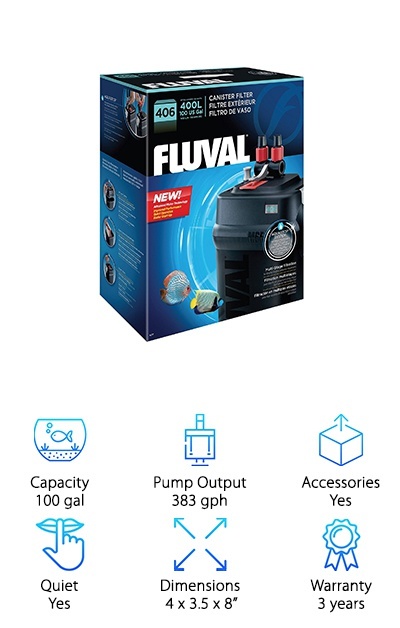 This pump isn’t recommended for turtle tanks, but for fish, it’s definitely one of the best aquarium canister filter out there. You get everything you need with this kit, including some media to get you started. That’s not all. It’s also really easy to set up and clean. 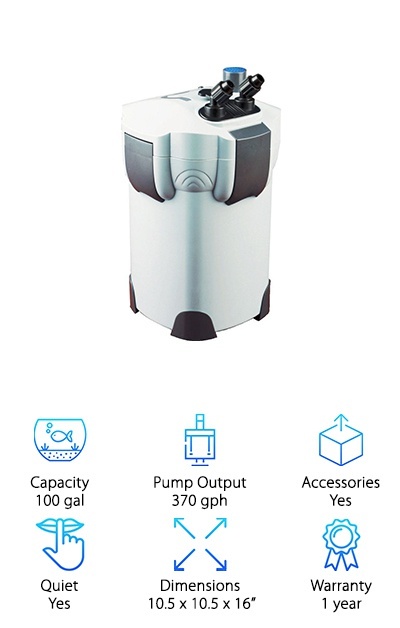 There’s a lot of buzz about this EHEIM Classic Canister Filter and we’re happy to say that it has earned its place in our best canister filter reviews. It has a solid, sturdy build and is energy efficient without sacrificing flow rate. It also manages to be exceptionally quiet. Like, you might not even know it’s working unless you get really close to investigate. It comes with everything you need to get started right out of the box. This includes filter sponges and EHEIM’s mechanical media and Substrat Pro biological media. These filters last a long time. What’s the secret? There are no actual media trays. Just a center divider which increases the surface area the water comes into contact with. And that means a clear tank for you. This kit from SunSun is unique because instead of 3 stages, it has 4. It comes with 3 media trays that let you customize your mechanical, chemical, and biological filtration exactly how you want it. And guess what else. It actually comes with a pretty generous amount of media to get started. You get a pound each of filter carbon, ceramic rings, and bioballs. But one of the great things about this filter is you can use whatever media you want. So, what’s the fourth filtration stage? The UV Sterilizer. What does it do? 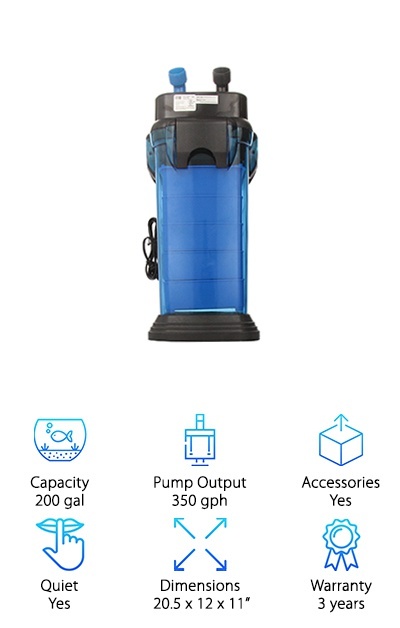 Uses simple UV light to kill algae, viruses, and any bad bacteria in the tank. This is a great value. It’s effective and convenient. Plus, it’s self-priming and easy to clean and maintain. The best canister filter for 55 gallon tank? It’s right here. Setup and maintenance are really simple because it’s really easy to access the media baskets. You’ll get maintenance done faster and with less spillage. There’s a lot of great filtering media included with this filter, too. You get a polishing filter pad to remove fine debris and Black Diamond Carbon to remove odors and impurities. That’s not all. Bio-filter balls and ceramic rings give you a large area for beneficial bacterial colonies to grow. Check this out. The media is placed in Stack N’ Flow trays that were designed so the water goes directly through the media instead of going around it. What does that mean for you? 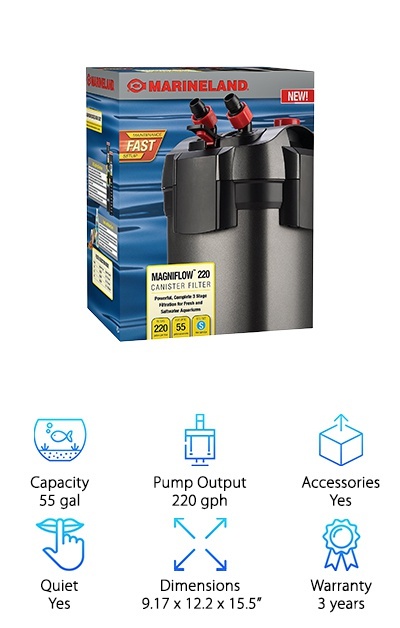 This 55 gallon canister filter is more effective filtering and clearer water. The media trays in this Penn Plax Cascade 1500 aquarium are one of the things that give it an edge. They’re large and can hold a lot of media. They’re also stackable so the water passes from one media to another effortlessly so you can try different combinations and see what one works best for you. Another good thing is it’s easy to operate. So easy, in fact, that’s it a good choice for newbies. All you have to do to prime it is push a button. There’s also an easy shut off valve to use when it’s time to do maintenance. Another cool thing is 2 independent taps. Each one is adjustable 360 degrees so you get a little more control with this filter. Plus, it just looks cool with its bright blue hue. It might sound like a simple thing, but something that makes this a best canister filter for aquariums is its shape. A simple rectangle. What’s so special about that? Increased capacity. Think about it: a rectangular tank can hold a lot more media and water than a circular one of about the same size. More water comes in contact with the media which leads to more effective filtering. Something else cool about this one is the no bypass design. Water always flows through the filter, it has nowhere else to go! Set up is easy and it’s simple to use so this might be a good choice for a first timer. You get all the necessary media with it, too, so it’s ready to go right out of the box. When it comes to the best aquarium canister filters, this is one of the most modern ones available. Most of the biggest innovations were aimed at making setup and maintenance a little easier. How does it do it? There’s a removable valve base for easy, mess-free maintenance. Plus, the adjustable flow rate lets you customize it for your tank’s specific needs. They even made it easy to set up inside the tightest spaces, like small aquarium cabinets. This holds a good amount of filtration media and comes with everything except biological media. Oh, and one more thing. This one also has a UV light. This is something that’s showing up on some newer filters. It acts as a fourth filtration method that kills algae, bad bacteria, viruses, fungus, and more. If you’re looking for the best canister filter for turtle tanks, this is a great choice. 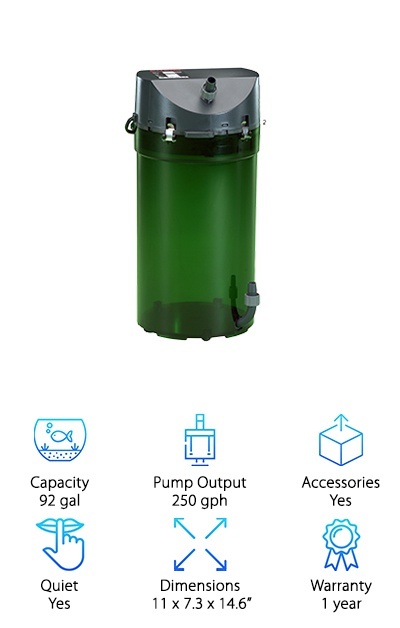 It uses high water pressure to force the aquarium water through the filter media. This is a good fit for turtle tanks, which can get a little messy. Your turtles will love it because you could easily set it up so the return water provided them with a little waterfall. Just to give them some added ambiance for their tank. There are 3 media trays that you can fill however you want. 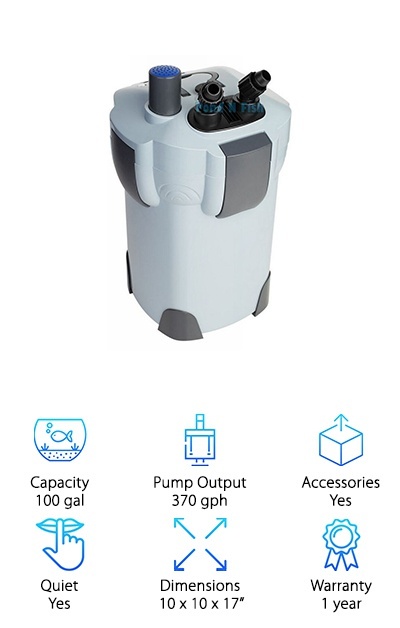 This pump also has a self-priming feature that makes it easy to setup. Plus, the single valve disconnect makes maintenance a breeze. While this is the best canister filter for 75 gallon tank, it’s also the best canister filter for turtles. This is called the polishing filter because of the water polishing option. You’re probably wondering what that means. It’s mechanical filtration that’s designed to get out even the tiniest bits of debris. What makes this one stand out from all the other canister filters we reviewed is that this one goes right in the tank. The others are all designed to be hidden in a cabinet or placed next to or behind the tank. Because this get submerged in water, it’s much easier to set up. No priming necessary! If you think your tank is clear, wait until you run this on the water polishing mode. We never imagined that it could make that much of a difference, but the teeny particles it clears from the water really make a difference!